The groundhog predicted an early spring. Then came this year’s winter vortex. Regardless of what happens next, the waning days of winter are a time of excitement and planning for a new season in the vineyard. Plus, it’s a good time to consider how to improve the soil biosphere the vines inhabit. Soil health has been the buzz across agriculture for the past couple of years as USDA, soil scientists, conservationists, and input suppliers have dished the dirt to stoke this hot topic. Vineyard managers may wonder what the fuss is about. Many have been ahead of row crop farmers several years. After all, vineyard soil almost always presents challenges requiring attention. Even soils ideally matched to the wine grapes growing in them still need a lot of TLC to improve root habitat. From South Dakota to North Carolina, many growers are already in the soil health vanguard. 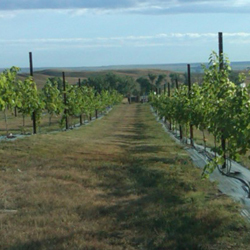 Mike Gould has called his family’s Old Folsom Vineyards near Rapid City, South Dakota ‘the miracle on the prairie” in part because of the soil conditions when it was first planted in 2007. A soil that primarily comprises calcium carbonate, lots of chalk or limestone, and some fossilized shells isn’t always a happy place for plants. Over the years of working with his long-time nutrition consultant Larry Shafer with Agro-K in Minneapolis, Gould has developed a soil health program with BioMax as the cornerstone, though this year Gould may try the newer formulation, BioMax Dual Action +. ‘This soil probably hadn’t been fed any time in the last millennium,” says Gould. ‘When we first put BioMax on we mixed it with molasses to provide long carbon chains to slowly release the nutrition and stimulants into the soil. Within about three days of the soil application you can almost see the vines kick-start like they’ve been turbo-charged. Even with such abject soil we see really good results. Maybe it’s just that the poorer the soil the more you notice it. Regardless, it’s night-and-day after the soil treatment. ‘We do an early spring feeding of BioMax with molasses to the root system. I can’t tell you the biodynamics of it, but I’m a believer that it’s helpful. In fact, it’s probably the most important treatment in this vineyard. We do another four or five foliar nutrient applications during the season, which may include potassium, molybdenum and other nutrients, depending on petiole analysis results. Shafer explains that BioMax is a fermentation-based soil fertilizer containing enzymes, fermentation co-factors and micronutrients. It is a complex microbial food source which stimulates and increases native, existing beneficial aerobic bacteria and soil fungi such as mycorrhizae that are already present in the soil. In the Dual Action version, a complementary seaweed extraction and stabilization technology is added to promote root and vine growth. Old Folsom has more than 2,000 vines of Frontenac, Marquette, Frontenac Gris, Brianna, Nebbiolo, and La Crescent. The latest addition was the new Petite Pearl. The mission is to produce high-quality, chemical-free grapes grown with a sustainable approach and environmental stewardship of the land. The dedication has paid off. By the harvest of 2014 Old Folsom had seen a 30 percent increase in yield off much healthier soil and vines, Gould says. The vineyard was poised for another bounteous year in 2015 when a ferocious hail storm struck just as the vines were in florescence. While stimulating and feeding the soil biosphere is a key part of a soil health program, another component is a cover crop between the vines. The cover crop helps add organic matter and nutrients to the soil, deter erosion, and hold moisture. But many traditional covers for row crops are impractical in hilly vineyards, or even more level ones if they are open to visitors who take tours and who may even volunteer to help with harvest. Grasses that can be mowed seem more suitable to many vineyard managers, and they still provide the soil health benefits. Others with more hospitable soil have also seen progress when they’ve included soil health as a focal point of vineyard management. Ernie Betker’s Trout Brook Vineyard near Hudson, Wisconsin, is on 30 acres of farmland previously planted with corn and soybeans for many years, then turned to hay and cattle grazing. The soil health program includes fall soil and fertility treatments in addition to spring applications. ‘This spring we’ll put on our usual root feeding of 3-18-18 plus BioMax Dual Action+ at two quarts per acre with a couple of gallons of molasses per acre to help with organic matter in the soil,” says Betker. ‘The same application goes on in the fall, with two additional applications. One is sprayed while there still are leaves on the vines. The second may go on after the leaves are down because the material we use can be absorbed through the wood. It helps harden off the vines for health during winter. Adding liquid potassium to one of the applications every other year or so helps deliver a little more of that nutrient to the soil. Betker does tissue sampling twice a year to adjust the foliar fertility program. Soil testing is every two years, with Midwest Laboratories in Omaha, to get a reading on any deficiencies that are showing up. Betker goes over those results carefully and develops remedial steps. Betker maintains grass between the rows of vines, which also helps impart some additional nutrients to the soil while encouraging the health of the micro-organisms. 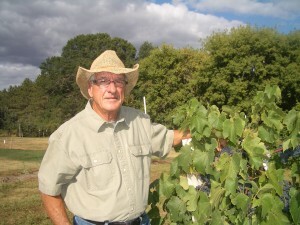 Andy Shores, who manages the Raffaldini Vineyards near Ronda, North Carolina, has 43 acres of sometimes challenging soil he hopes to improve each year. 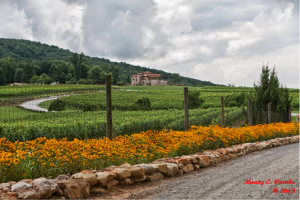 The vineyard is nestled about 30 miles west of Winston-Salem in the Yadkin Valley and Swan Creek area. The land resembles the winemaking regions of Central and Southern Italy with rolling hills, rocky schist-based soil, gentle breezes, and constant sun across northern and eastern inclines, with excellent drainage. ‘Most of our good, older blocks have rocky and sandy-loamy soil, but we also have one block with that old Southern red clay,” says Shores. For 2016 he plans to try BioMax Dual Action + in the red clay to see how the vines react. In 2015 he used the treatment in the other blocks and was generally pleased with the results, though he wants a couple more years of testing to feel more comfortable with the newer mixture. 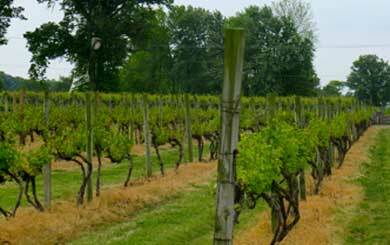 The vineyard website (www.raffaldini.com) describes a holistic spray program relying heavily on organic and natural treatments for nutrition and pest control, as well as treatments to stimulate and improve soil health. The soil health program begins in mid-January with applications of compost Shores creates using the pomace, grape skins, leaves and grass clippings. ‘There’s never enough of it so we buy some compost as well,” Shores says. ‘We spread that under the vines so when we get snow or showers it will soak in slowly. The best time to apply it is during our down time in winter so tractors can get through on firm ground. The soil biosphere treatment begins at bud break, which can come any time between the third week of March and the second week of April. The mixture will be BioMax Dual Action+, molasses, and a blend of micronutrients. The treatment will be applied through drip irrigation and will be repeated at least once a month, depending on whether there has been too much rain or water is in scarce supply. 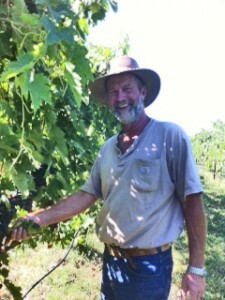 Shores said he already has seen how well young vines respond to soil treated with BioMax. This is an important need at the Raffaldini Vineyard. ‘We don’t have a lot of vines that are 15 or 20 years old,” he says. ‘A lot of ours are 2, 3 or 4 years old. Some of that is because of winter kill and some is because we experiment with different varieties. When we first started, we didn’t know what Italian varieties would grow here. It’s not like California where you could just ask a neighbor, so we just did trial and error. We’d experiment by planting one or two acres, then pull it up and try something else. We were the first one on the East Coast to plant Vermintino and Montepulciano. Now we are down to nine varieties. He said that in 2014 when newer vines were just two years old, some had three clusters per shoot. ‘We dropped them to one cluster per shoot and wound up dropping more than we kept that year,” Shores says. ‘I’ve been managing this vineyard since 2002, and I’ve never seen 2-year-old vines have that much fruit on them. Something made the difference, and I believe a lot of it was better soil health.